Bethany Coursen and her husband own the Valleywide Farm in Centre County. Coursen said last year's rain has a lasting impact on her farm. Pennsylvania had one of the wettest summers on record last year. July 2018 was the rainiest July in the past 124 years, according to the National Oceanic and Atmospheric Administration. The intense rainfall and flooding caused farmers across the state to lose significant crops, and 61 counties declared disaster. Bethany Coursen, a farmer in Centre County, said the weather made everything from planting to harvesting more challenging. Her farm grows corn, hay and soybeans and milks 50 to 60 cows. Bethany Coursen is a Centre County farmer and the president of the local farm bureau. 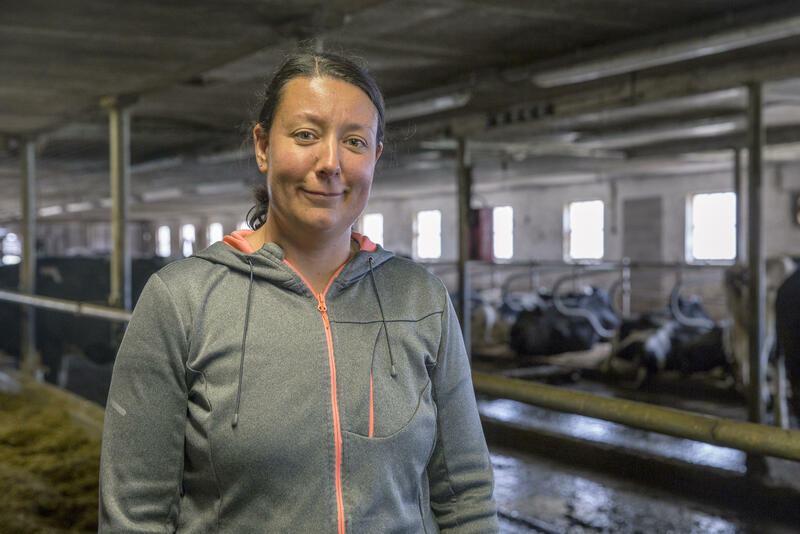 Her farm milks cows and grows multiple crops. Coursen said the wet weather had a lasting impact. A lot of farmers had losses from not being able to get into the fields in a timely manner. She said the final harvest of last year’s corn crop only happened a few weeks ago, which is very unusual. Coursen expects to continue to deal with toxins and molds resulting from the rain, which will cost extra in the farm’s operation. In March, the U.S. Department of Agriculture began offering a low interest disaster relief loan for most of Pennsylvania, as well as parts of New York and New Jersey. It’s intended to help farmers replace what they lost due to the rain. Farmers can borrow an amount that’s 100 percent of their loss or a maximum of $500,000. Coursen isn’t planning to apply. With consistently low dairy prices and the trade dispute between U.S. and China impacting her soybeans, she is not in the position to take on debt. “To take on more money, at least for my perspective, that’s certainly not what we want to do,” Coursen said. Gary Groves, the head of the Farm Service Agency of USDA in Pennsylvania, said he understands completely. Eligible farmers have until November 20 to apply for the emergency loan through the Farm Service Agency in their counties. Farmers in Columbia, Lebanon and York Counties have until July 29. Between the dairy crisis, turmoil in the soybean market and the volatility of the weather, Coursen said spring planning for this year was more stressful than usual. Alisha Risser owns one of those dairy farms. Seventeen years ago, Risser and her husband started a contract with Swiss Premium, a brand of the national distributor Dean Foods. In those days, Risser said business was good. Pennsylvania Auditor General Eugene DePasquale hosted a public hearing on Penn State’s University Park campus on Thursday, to gather input for a special report looking into the state’s response to climate change. DePasquale said climate change is both an environmental challenge and an economic challenge for the state and the country.